eCommerce Analytics - finding the right analytics data. When you take that first deep dive into eCommerce analytics for your online store, things can get overwhelming fast. There’s so much data to be explored, so many lessons to be learned, that you can hardly be blamed for not knowing what to do first. One of the biggest challenges you’ll face is knowing what data is important (and what’s not). You can only focus your time and attention on a few main goals at a time, so the data you review and act on should be chosen carefully. But how can you tell which metrics match up to what you’re doing? Or, if your store is new, how can you know which metrics you should be tracking — and focusing your efforts on — first? Today, you’ll learn which metrics you should track for your specific store. Ready to dive into the data? Let’s go. Although there are a great number of solutions available for tracking and reporting on an online store’s activity, we recommend Google Analytics for those who are either new to analytics or eCommerce (or both). Google Analytics is a great starting point not only because it’s free, but also because it can capture and report on a ton of data. Store owners can find and review as much or as little as they wish, on their own time, and with no restrictions. If you’re using WooCommerce, you can quickly integrate Google Analytics with your store via the Google Analytics Pro extension. This extension provides enhanced eCommerce tracking, as well as fine-tuned tracking and reporting on events like items added to the cart, completed purchases, coupon usage, and much more. 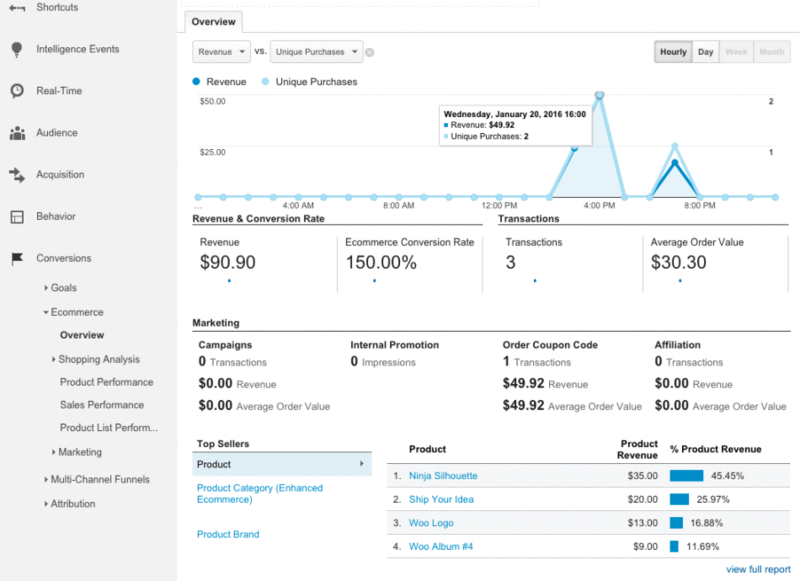 Google Analytics and WooCommerce, a match made in data heaven. Once you have Google Analytics set up for your store, you’ll have to narrow down what you’re tracking — a necessary step so you don’t spend hours sifting through data. Google Analytics is stuffed to the brim with reports, data visualizations, tracking, and opportunities for learning. Let it run for a week or two and you’ll be chomping at the bit to learn. But it’s extremely easy to get in over your head, or confused about what you’re even looking at. 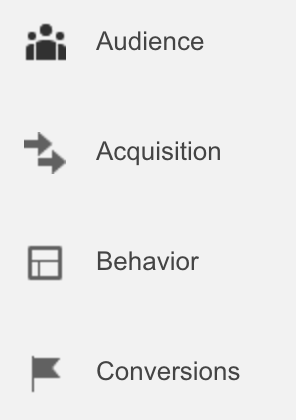 The four main data sections offered in GA.
One of the best ways to break down what you’re capable of tracking with GA — and what you should focus on first — is to have a look at the four “categories” on the left side of your screen: Audience, Acquisition, Behavior, and Conversions. Behavior: how that audience and your store act — what pages visitors go to, how quickly your store responds to their requests, what coupon codes are used, etc. By having a general knowledge of what information is available, and in which part of Google Analytics, you can avoid getting lost or wasting time clicking around looking for data. Let the above descriptions be your guide — come back to them any time you need them! Although you can track much more than what’s listed above, if you’re new to this, you should absolutely start small. So with that in mind, let’s keep moving so we can help you find out which metrics you need to keep an eye on. The first thing to consider when deciding what to track is how old your store is, and what stage of growth it’s in. If your store is brand new, and is still struggling for every sale, it doesn’t make sense for you to put emphasis on the same data as a store that’s been around for a few years and doesn’t have any trouble attracting visitors. Your needs are different, and your goals are different. Basically: the newer your store, the bigger your focus on traffic. The reports you pay attention to in the early stages should be ones that detail how many visitors you have daily, weekly, and monthly, and where they are coming from. As time goes on and traffic is easier to gain, you can shift your focus to conversions, and looking at how your visitors interact with your store along the way to making a purchase. What goals do you have for your store right now? Sure, everyone’s goal is “make lots of money,” but what immediate goals do you have in mind? 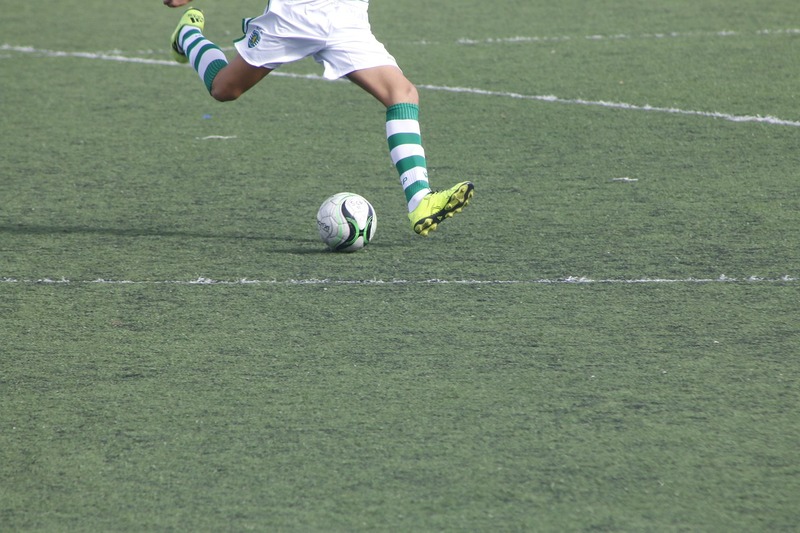 Don’t think about the goals you want to score later. What’s the one goal you’re poised to score right NOW? The data you track in Google Analytics should support the goals you’re working to achieve. It should help keep you focused on the objectives you’ve set, and provide updates to you and your team. Of course, you can’t simply set goals and track data without doing something. Finding the data counterparts in Google Analytics to track should be your last step, done after you’ve made your plans (whether they’re to scale traffic, boost conversions, or what have you). One word of advice: don’t set too many goals at once. It’s natural to aim high, but the results can be disastrous. As your store (and potentially your team) grows, you might find that you’re more comfortable juggling multiple goals and experiments, and that’s fine. But for beginners, focus on one thing at a time and you’ll avoid getting overwhelmed or confused. Finally, consider what you’re doing to market your store to potential customers. Are you posting about new products on a Facebook Page? Or are you sending email campaigns to interested shoppers? The data you track should correspond to these marketing activities — that is, you should be tracking the outcome of your efforts and learning what worked well or what could be improved upon. Not sure what to track in GA? How about the results of your marketing? Most of the time, marketing data will be easy enough for you to find in Google Analytics. But depending on what you’re doing or the tools you’re using, you might have to set up special tracking using UTM links to receive accurate reports. Here’s an explanation of UTM that you might find useful, and you can use Google’s UTM link builder to create your own properly tagged links in just a few seconds. Nifty! 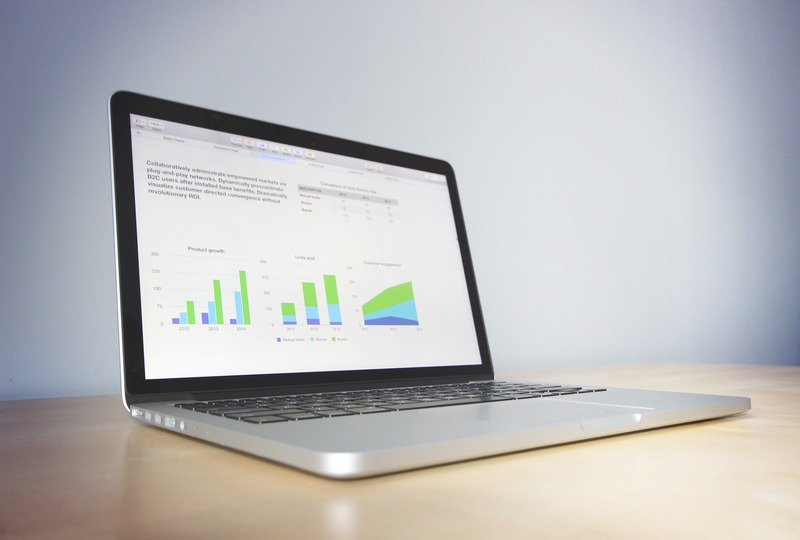 Google Analytics puts perhaps an overwhelming amount of data at your fingertips. As a store owner, it’s all too easy to get caught up in following and tracking everything, wanting to optimize traffic, click rates, conversions, you name it. But the best approach is to pick one strong focus for your store, and track the metrics in GA that correspond to it. Whether this is growing traffic, optimizing for visitors, or boosting conversions depends on your goals and the stage of growth you are at. The key is to know that you can only do one thing well at a time, and then do — and track — that thing as well as you can. We hope this has been insightful for those of you getting started with Google Analytics or tracking your store’s metrics. Have any questions for us? Leave them in the comments and we’ll be happy to respond ASAP.